Location: Saint-Germain-de-Salles, in the Allier departement of France (Aquitaine Region). Notes: The castle of Salles is a castle located in Saint-Germain-de-Salles, France.Salles would come from the word sala which means house, hotel ... It appears around 1265 when John of Burgundy acquired it. A certain Renaud Count de Forez was the lord. It passed in the sixteenth century in the house of the Peschin. 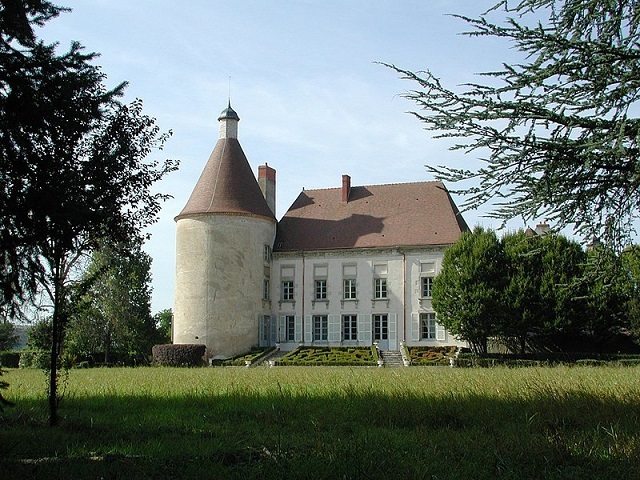 At that time, the castle consisted of a tower that belonged to Jacques and Francis du Peschin. Jeanne du Peschin, heiress of Antoine and Gilberte Esgrain, brought the land to her husband Blain de Chauvigny de Blot. The Chauvigny de Blot kept the land until the eve of the Revolution; It was sold on 7 December 1770 by Louis Charles Antoine Girard to the Delayre family. The building is listed under historical monuments in 1947.